The Cultural Resources Management Program coordinates interagency reviews of proposed revenue producing Trust land use to ensure compliance with the State Historic Preservation Act. In 1966, the National Historic Preservation Act (NHPA) was passed so cultural resources would be protected from damage caused by the actions of federal agencies. As a result of the NHPA, the State of Arizona established the State Historic Preservation Act (SHPA) in 1982 to protect cultural resources from the activities of state agencies. Cultural Resources are identified as archaeological sites, historic buildings and structures, traditional cultural places, and other places or objects that are important in or State’s history. The Land Department is responsible for managing cultural resources on State Trust Land to the extent necessary to comply with the SHPA. Two classes of such actions may be distinguished for administrative purposes, those which are initiated externally by private or public entities, seeking to use, occupy, cross or purchase State Trust land for any number of purposes, and those which are undertaken by the Land Department for land management or other fiduciary objectives. If you have questions regarding archaeological issues on State Trust land, or wish to report suspected damage to archaeological resources, please call us at 602 542-2119. If you believe archaeological vandalism is currently taking place, report it to the nearest law enforcement agency immediately. For further information on the State Historic Preservation Office, please call 602 542-4009. 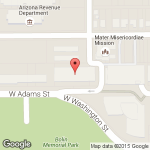 For further information on the Arizona State Museum, please call (520) 621-2096.